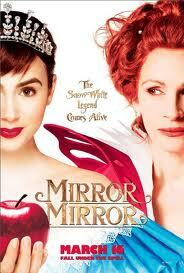 Win a family pass to see MIRROR MIRROR at a special event! To celebrate the release of MIRROR MIRROR on DVD & Blu-ray from 30th July, I am giving away a family pass for 4 to see an exclusive preview screening of the film in Central London on 23rd July. 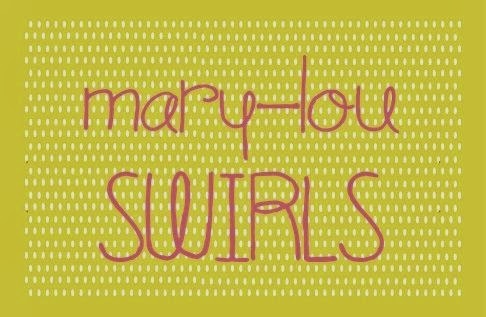 The event will have drinks, nibbles and activities for the kids from with a free giveaway for every child! One of the most beloved stories of all time gets a modern make over and comes to life, in this spectacular motion picture event starring Oscar®-winner Julia Roberts as the evil Queen and Lily Collins (The Blind Side) as Snow White. A fresh and funny retelling of the classic fairy tale, the film also stars Armie Hammer (The Social Network) as the Prince, Sean Bean (“Game of Thrones”) as the King, and Nathan Lane (The Birdcage) as the Queen’s hapless and bungling servant, Brighton. Open to UK residents only.To enter please leave a comment below. This competition will close at 5pm on Wednesday 18th July. Please note the winner will need to be able to get into London on Monday 23rd July at 11am. For as long as I can remember I’ve always been an avid reader. I guess it started way back when I was little and my Mum used to read to me every night although my Dad loved reading too. We always had plenty of books around and so to me it’s a completely normal thing. 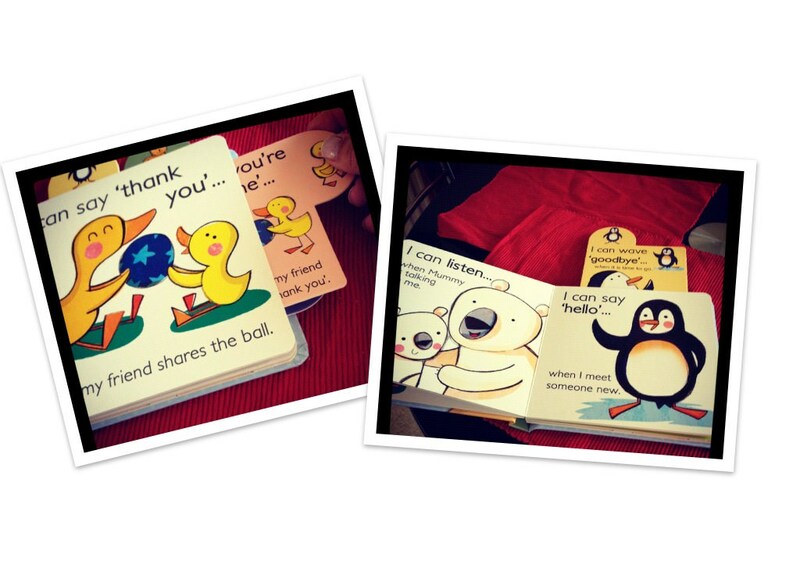 When Chick came along one of the first things that I bought for her was a book called 'Guess how much I love you?'. In the initial e-mail there was a statistic that six million adults in the UK are unable to read. A statistic that completely blows my mind!! Another alarming stat as the National Literacy Trust’s recent poll indicating that one in three children in the UK don’t own a book, Parragon aims to ensure that these fun books will ignite a passion for reading and a familiarity with books at the earliest stages of a child’s life. The Little Learners collection has been developed in conjunction with educational experts and tested by mums to stimulate and educate children and come in seven different formats including cloth, finger puppets and foam. 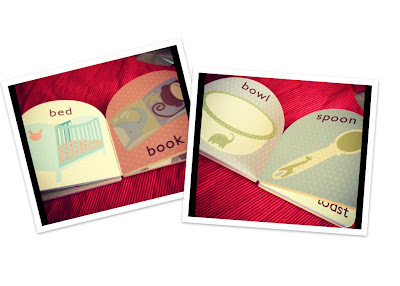 Night, Night and Yum Yum are foam books and really light.......therefore they don't hurt when dropped on little fingers and toes!! We had my almost 2 year old Niece take a look at them and she loves them. When there are great, simple books around like these, that are a very reasonable price it make you wonder why one in three children doesn't own a single book?!! The full range is available at all major retailers including Tesco, WH Smith, Sainsbury’s, Amazon and Early Learning Centre with books ranging from £2.99 to £6.99. The only moan that she has is about the bottle design as she says it difficult to get the lid off! I didn't find it a problem myself! The new juices are available in both squash and ready to drink cartons from all major retailers now. The large bottles retail for around £2.89 but I've seen them on offer today for £2. 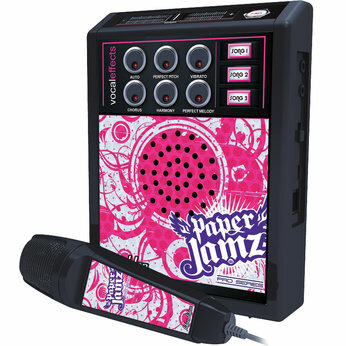 The blurb: Be a real superstar singer with the Paper Jamz Pro Mic. Sing a duet with the artist or go solo and become your favourite artist. The system features an auto mode that adjusts effects as your singing to recreate a track’s original sound. 1 built-in hit song and voucher for 3 downloadable songs. Buy new songs to add to your set list. 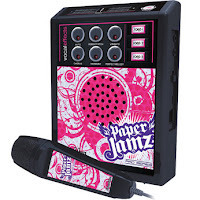 Jam with Paper Jamz Pro fans from around the world with your own virtual studio. We definitely need to download some more tunes as I’m heartily sick of hearing the three that come installed! The Pro Mic retails at £29.99 and for us would be well worth the money! This comes highly recommended from the girls in the Brooks household. The Blurb: Learn the secrets of luxurious cosmetics with Wild Science Face Mask Laboratory! Create your own clay face masks using the same ingredients as top brands and your healthy-looking skin will be the envy of all your friends. Follow the steps in the full colour instruction booklet which will teach you how to diagnose your own skin type and make the best custom cosmetics. Everything you will need is provided; just add water and a little imagination! 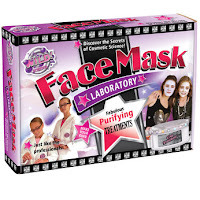 The perfect kit for sleepovers, there are four exciting experiments to try meaning girls will have hours of fun. Collect the whole range and open your own Luxury Day Spa! This is a great set that Chick and I had a lot of fun with. We liked it so much that we bought a similar set for her best friend for Christmas. It's fab for parties and sleepovers especially now that Chick is getting a little bit older and is after having movie nights etc with her friends!!! Retails at £14.99 from Toys R Us which I think is very reasonable for a good kit. 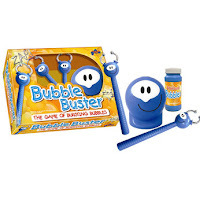 The blurb: Children will love this game of bursting bubbles! Simply turn on the bubble blower and get busting! The first player to burst 20 magic pinging bubbles wins! But beware! Only some of the bubbles have a magic ping, burst as many bubbles as you can and the pings will sound higher and higher until you burst the 20th magic pinging bubble and your wand plays the winner's chime. For 1-2 players. As we are very lucky to be Toyologists I try and share some of the joy with Chick’s after school club and because this is quite a hectic messy game I figured they would have much more fun trying it out than Chick and I. It's also difficult to count the one who is first to 20 when they are jumping around like lunatics!! The only other downside to the game is that it requires 4 x AA and 4 x AAA batteries and also that it’s quite messy....I guess it’s not so bad if you save it for mainly outside play during warmer weather!! Retails at £17.99 which is ok and is aimed at ages 4+ although I’m sure with supervision younger children would be able to play. It comes in lovely packaging with a cutey tag. The charms are lovely being a couple of stars and a handbag along with some gorgeous pink beads. Retailing at £12.99 I think this would be a fabulous present. If I was being super picky I would like the bracelet to be just a couple of centimetres longer so that I had a bit more wiggle room! The colours and charms of the bracelet are absolutely lovely and would match lots of different outfits. To enter and win all you need to do is visit the cutey site here and then come back and leave me a comment letting me know which is your favourite item. Brownie points for anyone who also tweets about it. Alternatively you can follow cutey on Facebook. Shake out your hair, turn up your style, put on your face and release your inner rock and roll party queen. Get ready for those "Summer Nights" with a return to Rydell High! Chick and I love the Grease film and like nothing better to sing along, so how much fun is it to be able to dance along too?? With over 20 familiar songs to sing along to including You're the one that I want, Greased Lightning and Summer Nights as well as all your favourite dance routines to learn. · A full duet karaoke experience is available in Karaoke Mode, with 20 songs to choose from including additional Rock and Roll songs from the 1950's. 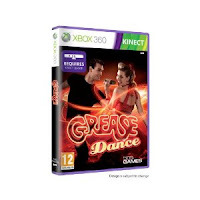 · Pick your partner, twist and shout, shake it out and rock around the clock for hours of fun in Dance Mode which enables you and a friend to dance simultaneously to your favourite Grease songs and Rock and Roll classics! · Up to 8 players can join in the fun of Party Mode, where the game pits players against one another in a team based dance, karaoke or even minigames session. · Take my Picture! Grease makes incredible use of the Kinect camera to allow you and your partners to view your best moves at the end of the dancing session! The Blurb: Two games in one! 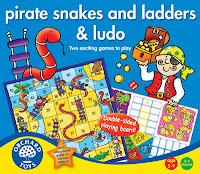 Old favourites are given an exciting pirate twist on this double-sided playing board. 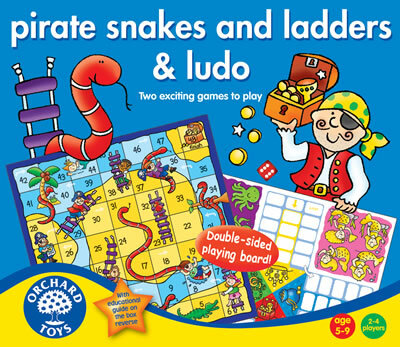 Raise the anchor and set a course for the buried treasure in snakes and ladders, or join the pirate fun on the ludo board on the back! I absolutely love these and would thoroughly recommend them. It’s a double sided set which we have played with constantly and it only costs £8.99. The set is bright and colourful and can be played by the whole family although due to the small pieces it’s recommended from age 5. The design is predominantly aimed at boys but Chick had no issues in playing with a ‘boys’ toy! Would make a fabulous birthday or Christmas present and comes highly recommended from the Brooks household! The blurb: Teacup Piggies are everyone's best friend! Dress them, feed them and take them wherever you go. 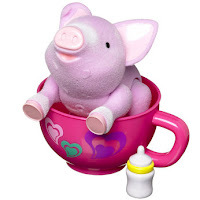 These cute interactive piggies talk and laugh and oink and each has her own unique personality. I can see why these may be attractive to children but if I’m honest it’s not something that I would buy for Chick. They are cute and interactive and they talk an awful lot but don’t say anything interesting. I don’t mind their American accent but it does get kind of annoying after a while. I think part of my problem with these is that they cost £15 but don’t really do much. Given how much she says that she likes it, she really hasn’t played with it that often at all. However, she is seduced by all the other accessories that you can buy to go with it and would really like the limo. I guess if you buy some of the other sets the kids would play with them a lot more. Available to buy in-store and online from Toys R Us at £14.99. The limo retails at £24.99. The Blurb: Move to the groove and compete to the beat! 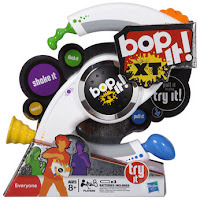 Bop It XT takes Bop It gameplay to a whole new level. All your favourite actions are here, bop, twist, pull, spin, and flick. Now you have a shake action too! Six different actions - things are going to get manic! A great game for children's parties. Adding to the excitement is a taunting, yet hilarious, electronic announcer directing your every move. The better you get the faster it goes, and when you miss a beat you'll hear about it! Practice alone and play at parties, it's a game you are compelled to beat! Retails at £17.99 from Toys R Us and is available online or in-store. It’s aimed at ages 8+ and as I say Chick struggled initially so I think that is about right, although younger children could play.